Facebook continues to be by far the most popular social media platform, used by 79% of online adults in the US, according to a new study from the Pew Research Center’s Internet & American Life Project. 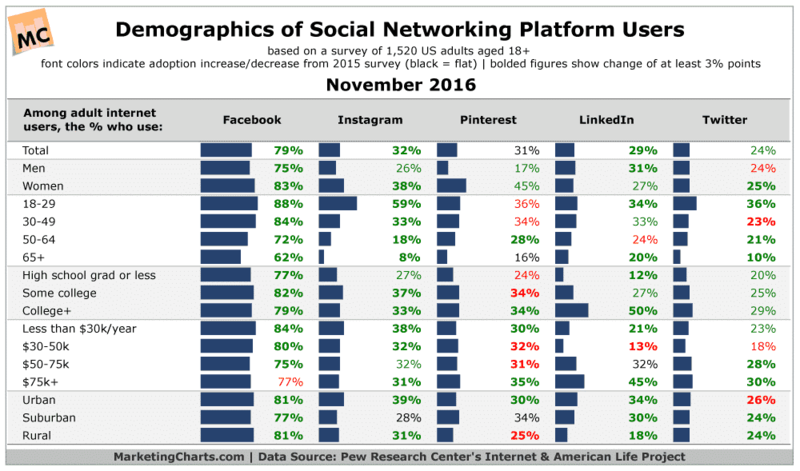 Beyond Facebook, other major platforms are tightly bunched, with Instagram overtaking Pinterest in adoption. While Facebook is up among men, seniors, lower incomes and rural dwellers, affluent users was slightly down. Instagram is up among women, lower incomes and rural dwellers. Pinterest does now show any increase in adoption overall, however lower incomes increased usage. LinkedIn experienced a rapid adoption increase, expanding age group spans and in rural dwellers. Twitter experienced a change in demos, attracting rural dwellers, women and 50-64 age group. Few social platforms are used daily except for Facebook. Not surprisingly, social media site users don’t rely on just one social network for their social media fix.